Eversharp Skyline fountain pen and mechanical pencil with green bodies and green/black striated caps. They both have uncommon wide plain cap bands and gold derbies. 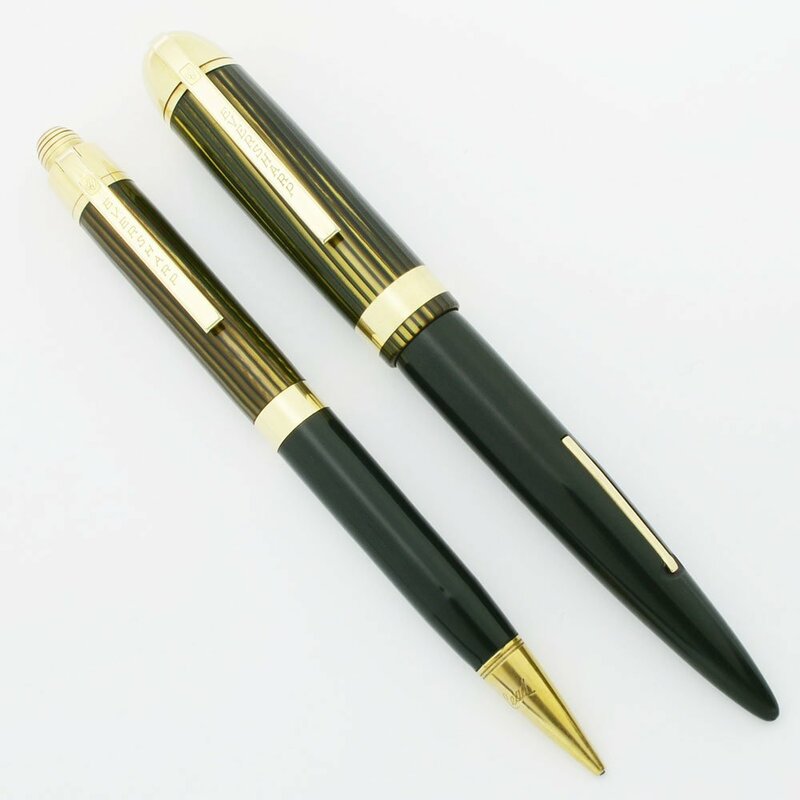 The fountain pen has a 14k extra fine nib and the mechanical pencil takes "thin" or .9mm leads. Excellent + restored condition. Product Name Skyline Demi. This is one of the upgraded versions sold in jewelry stores with gold filled derbies and wider cap bands. Length The fountain pen measures 4-15/16" and the pencil measures 4-5/8". These are the demi size. Filling System The fountain pen has a lever filling system. We replaced the sac and it's working well. The pencil has a clicker mechanism to extend and retract the leads. It takes 0.9mm or "thin" leads. 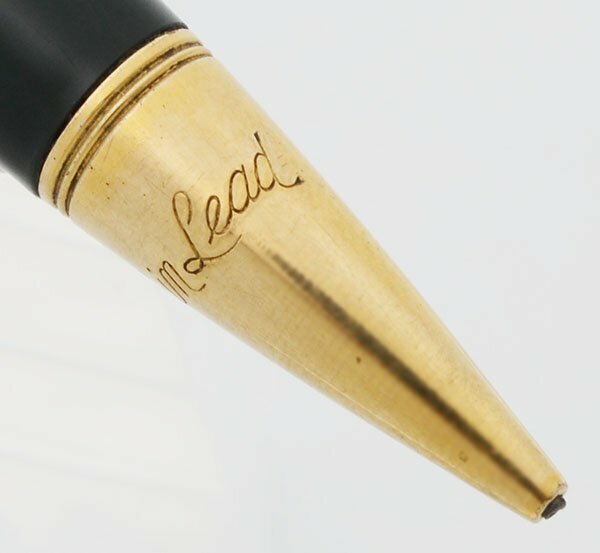 The pencil cone has "thin leads" etched in it to identify lead size. Color Marine Green, a dark almost green black, barrel and section with green/black striated celluloid cap. The cap is a yellow-red tinted material with green and black lengthwise stripes. The cap derby is gold filled and it has a 3/16" wide plain cap band. 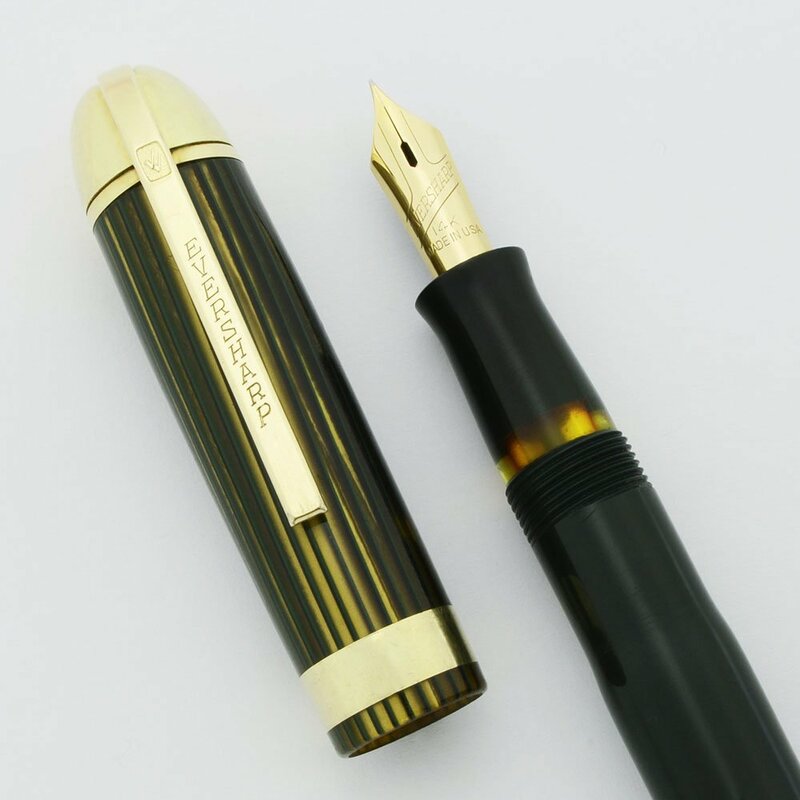 Nib EXTRA FINE 14k nib. It's got plenty of tipping and feels smooth. 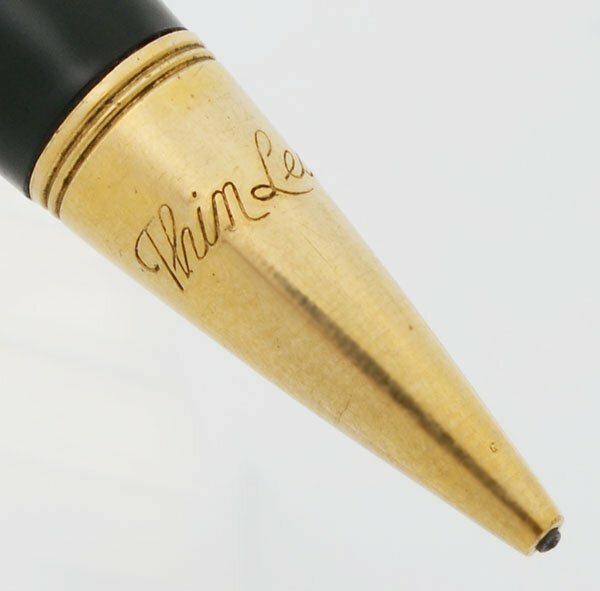 The nib is one of the manifold nibs and is firm. Condition Excellent + condition. 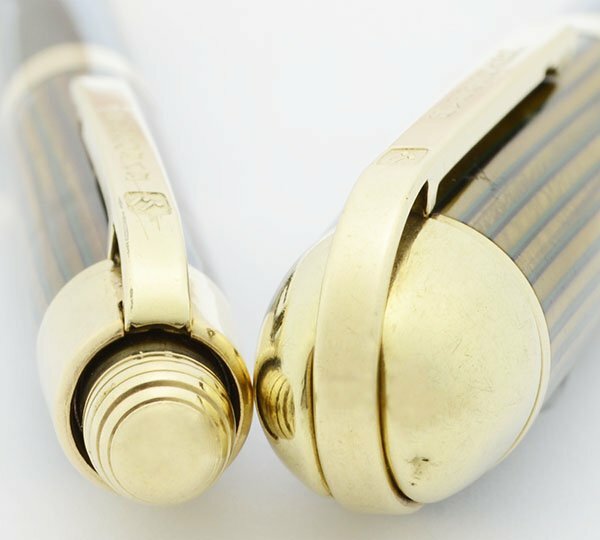 The fountain pen derby has two dents at the top and one lower down to the left of the clip. The cap band has a few dings. The celluloid in the cap has enough handwear to look a little dull in hand but there are no real scratches. The viewing window is very clear. The pointy end of the barrel has a few small cracks which are common to Skylines. The mechanical pencil trim has brassing on the cone but no dents or dings on the rest of it. All imprints are clear and there is no personalization. Both pieces are working very well.